I hope you are enjoying it. I’ve also revived my blog in Spanish, Petalos de Maria, where I’m endeavoring to post at least one entry a week. The wonderful Lisa Hendey at CatholicMom.com has picked that up and is running the Spanish with the English translation on Thursdays. I hope you check out one or the other. In the meantime, here’s what I posted this week, and below, you can read it in English. Lent is well under way. I usually have many ideas about what I need to do for myself at the beginning. For me, it’s like an opportunity for a spiritual reboot, a chance to begin again. It’s not unlike making New Year’s resolutions. And like those resolutions, my Lenten ideas tend to peter out sometime into the second week, and I fail to accomplish the lofty goals I set for myself. I thought I’d keep it simple this year. Stick with the simple, which doesn’t necessarily mean easy. One of the things I’ve set out to do is work on my prayer life. Because of the nature of my schedule, I can’t make a commitment to daily Mass. I’ve added certain prayers and routines over the years, so the challenge is to find a place to add, to enhance what I’m already doing. There’s no question that my prayer life would benefit greatly from a more robust approach to prayer. With that in mind, I’ve made a commitment to the Stations of the Cross on Fridays, and rather than attending a group worship service in the evening, I’ve started going alone in the late afternoon. I’m stretching myself with an hour of prayerful meditation on those Friday afternoons. I think enjoy is probably not the right word for this exercise, but it has definitely been something worth doing, and very likely, a practice that I could incorporate year round, if not weekly, then perhaps monthly. In walking along with Jesus in His Passion, I’ve been able to participate in His suffering, to meditate on humility, and focus less on what I have and meditate more on what Christ has given me in Salvation. It is a journey of suffering that accounts for my stumbles and falls, and the graces, too, as I experience with Christ, humiliation, weakness, pain, and also tenderness and love. I don’t see the post until after I get home from work, but I am sure that is for a reason. I need the serenity of your posts to calm me from the hectic day. I am enjoying this, Maria. I appreciate the thoughtfulness demonstrated in your Lenten photos. it is a nice way to start the day – peaceful, serene and contemplative. 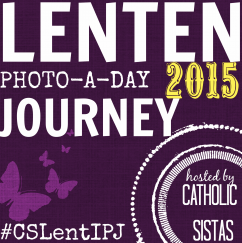 Your photos each morning are a special part of this Lent. They help me to spend some time in reflection. Thank you! Oh thank you, Mike. I am happy to know I have some folks on the journey with me.